Robin Lim, an American woman who has helped thousands of poor Indonesian women have a healthy pregnancy and birth, was named the 2011 CNN Hero of the Year on Sunday night.Through her Yayasan Bumi Sehat health clinics, "Mother Robin," or "Ibu Robin" as she is called by the locals, offers free prenatal care, birthing services and medical aid in Indonesia, where many families cannot afford care. "Every baby's first breath on Earth could be one of peace and love. Every mother should be healthy and strong. Every birth could be safe and loving. But our world is not there yet," Lim said during "CNN Heroes: An All-Star Tribute," which took place at the Shrine Auditorium in Los Angeles and recognized Lim and the other top 10 CNN Heroes of 2011.Many women in the developing world do not have access to contraception or maternal care. According to the United Nations Population Fund, three out of five women giving birth in South Asia do so without a skilled birth attendant on hand. CNN Hero: Robin Lim Portrait of a Hero: Robin Lim Celebs, 'Heroes' hit red carpet CNN Heroes: Top 10In Indonesia, the average family earns the equivalent of $8 a day, according to the International Monetary Fund. But a baby delivery costs about $70 at a hospital, and a Caesarian section can cost as much as $700.Lim believes Indonesia's high maternal and infant mortality rates are caused in part by these costs, which many women cannot meet. "The situation is bad ... babies are unattended, deliveries have become commercialized, and mothers die from hemorrhage after childbirth because they can't afford proper care," Lim told CNN earlier this year.The CNN Hero of the Year was chosen by the public after an 11-week vote on CNN.com. For being named Hero of the Year, Lim will receive $250,000 for her cause. That's in addition to the $50,000 that she and the rest of the top 10 Heroes each received for making the top 10. This is the fifth year that CNN, with the help of entertainers and other celebrities, have honored everyday people changing the world. Among this year's presenters were comedians Jerry Seinfeld and George Lopez; actors J.R. Martinez and Chris Colfer; musical artists Ice Cube and will.i.am; model Christy Turlington Burns; former NFL quarterback Kurt Warner; and actresses Laura Dern, Mary-Louise Parker and Sofia Vergara. (Photos: Scenes from the night)Kid Rock performed the song "Care" from his platinum-selling album "Born Free," while Miley Cyrus sang her triple-platinum hit "The Climb. "Turlington Burns introduced Lim's video tribute during Sunday's show, before the Hero of the Year announcement. As founder of Every Mother Counts, she is also a passionate advocate for maternal health around the world. "Eight years ago, after giving birth to my first child Grace, I felt what could have been a life-threatening complication," she told the audience of nearly 5,000. "It suddenly got very scary, very fast. If I hadn't received the expert care in the hospital birthing center I was in, then I may have not been so fortunate.Robin Lim: What's next? 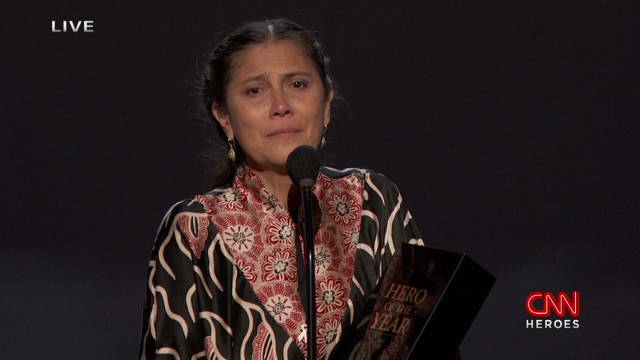 Heroes honored for changing the world Gupta backstage at 'Heroes' CNN honors top Heroes of the year"My wish is that every mother all over the world has the same chance surviving childbirth I had. My friend Robin Lim shares that wish and she spends her days and nights making it so. "Photos: See how Lim helps thousands of womenTurlington Burns recently made the trip to Indonesia to meet Lim and see her work firsthand.Lim became a midwife after her sister -- and her sister's baby -- died from complications during childbirth several years ago. She and her husband then sold their home in Hawaii and moved to Bali to "reinvent their lives," she said. "It was there she learned she could make a difference," Turlington Burns said. "She opened a clinic, Bumi Sehat, so poor mothers can give birth safely and be treated with dignity and respect. She has delivered thousands of babies, and that is why they call her 'Ibu' -- Mother. "After being announced as the CNN Hero of the Year, a tearful Lim accepted the award from host Anderson Cooper and made an impassioned plea for help. "Today on our Earth, 981 mothers in the prime of their life will die -- and tomorrow again and yesterday," she said. "And I'm asking you to help change that. We don't even know how many babies are lost, but all of us can help change that." Bali with Kids has been an excellent resource for me and my kids during our recent holiday in Bali. It has LOTS of info and it made us discover great places in the North of Bali and on the East coast. The shopping tips and addresses saved us time and money too. This guide is easy to read, has lots of attractive photos and up-to-date info. It's great value and we highly recommend it.